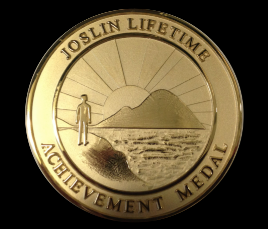 The Joslin Medalists are people who have completed 50 years with type 1 diabetes, and who have been awarded a medal for that accomplishment. There are more than 5000 individuals who have this medal. The picture below shows medalists who attended a meeting in Boston in 2011. I am the taller fellow in the center of the back row. There are also 75 and 80 year medals. If you know any long term type 1 diabetics in any part of the world, and they do not have the medal, be sure to tell them to apply. 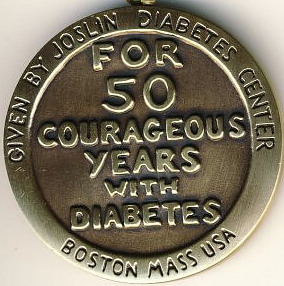 The medals shown are, from top to bottom, for living 50, 75 and 80 years with type 1. 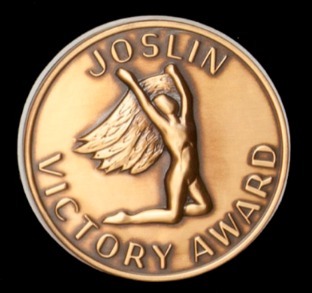 The Joslin Medalist Study in Boston examined 1000 medalists during the period 2005-2015. It was funded by JDRF, NIH, and private donations. I participated in 2009 and again in 2017. The examination was very thorough, and my past history was required, in detail. Many tests were performed while I was at the Joslin Center. Many very interesting things were found during the study, including the fact that many of us still produce some of our own insulin. Dr. George L. King is the head of the Joslin Medalist Study in Boston. His area of expertise involves researching the causes of, and preventions for, diabetes complications. Here is an article, about three years old, about the research. The quotes are Dr. King's own words.